Naughty by Nature, BlackBerry by Choice! How's this for a T-Shirt to wear to Waterloo?! I'm heading to Waterloo next week for Research In Motion's Annual General Meeting of Shareholders. I need a t-shirt to wear. Last year I wore the RIMPIRE Strikes Back. It was a big hit with those in the know, though I have realized since then the average person doesn't know what RIM is, nevermind the RIMPIRE. So this morning I asked the CB Nation for ideas and our readers delivered. A bunch of great slogans were suggested, so I'm going to work on getting a few of them designed up. 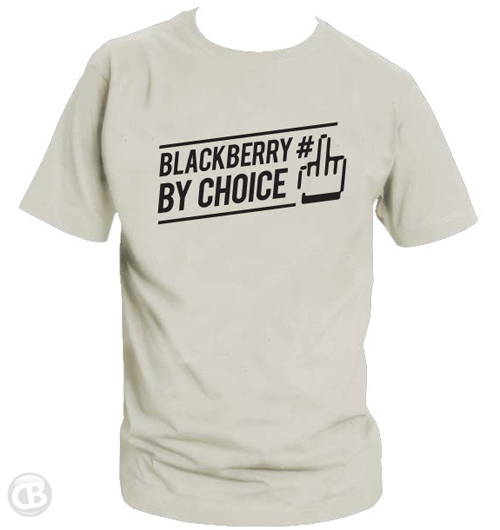 One of the most popular slogans suggested was BlackBerry By Choice. This is play on the phrase RIM's CEO used this week in his Editorial to the Globe and Mail where he said, "They are - like many of us - BlackBerry people by choice." Consider this a working draft... but if you guys like it, I'll make the .EPS file available so you can download it and make your own. Or if you have any awesome suggestions on how to tweak it up, let me know in the comments. Just let me know quick - gotta get some of these babies printed up before I fly out.